You guys know that I love sharing my style inspiration, but coming in as a close second is my love for working with paint. I love finding the perfect color or exact neutral that a room calls for. Understanding the way that undertones play such an important rule in picking paint colors (when it comes to neutrals especially) has made all the difference when specifying colors for my clients. Well, I didn’t understand any of that when I was selecting paint colors for our home 3.5 years ago. I painted a large white square in every room and then painted 10 different shades of greige to sit and stare at. I eventually came to a decision that I was happy with for every space, but it was quite a time (and money) consuming commitment. Studying under Color Expert, Maria Killam last year and making the investment to have her color boards on hand now makes this process exponentially easier! Having the top Sherwin Williams and Benjamin Moore colors on hand to move around and compare/contrast allows me not only to see how each shade would look, but also to show my clients why one color will work better than another. 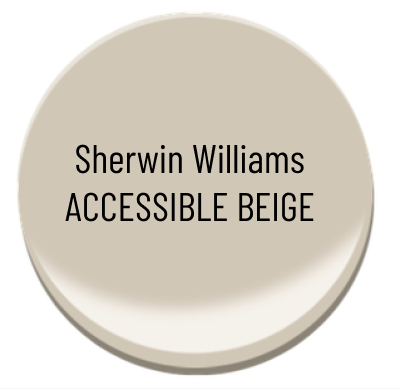 With all that being said, today I wanted to share one of my favorite neutral paint colors, Sherwin Willams Accessible Beige. This color runs though most of our home including our living room, kitchen, master bedroom and our sons bedroom. These days I feel like the term beige can scare people away. We immediately picture those warm yellow and orange beiges of decades past and in fear turn to a grey that may end up feeling too cold. Accessible Beige actually borders being a gray and falls into the greige category. It technically has a green undertone but it can be a bit of a chameleon in different spaces. It gives a great warmth to our walls that I absolutely love and I have carried that love into a number of other homes that I’ve had the chance to work in. I wanted to share some of those spaces with you today so I can make a case for this beautiful hue. 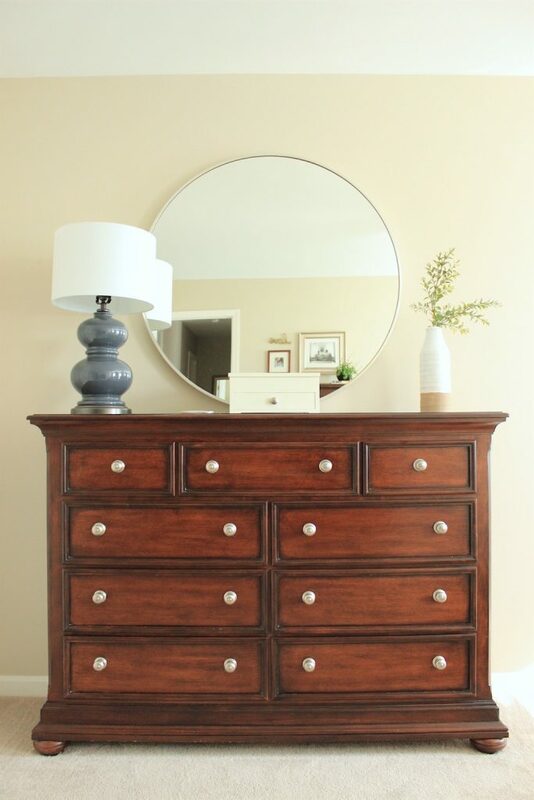 Here’s our master bedroom that I have shared before (see the full post here). Making sure it worked with the carpet was key and then I was able to decorate around it. 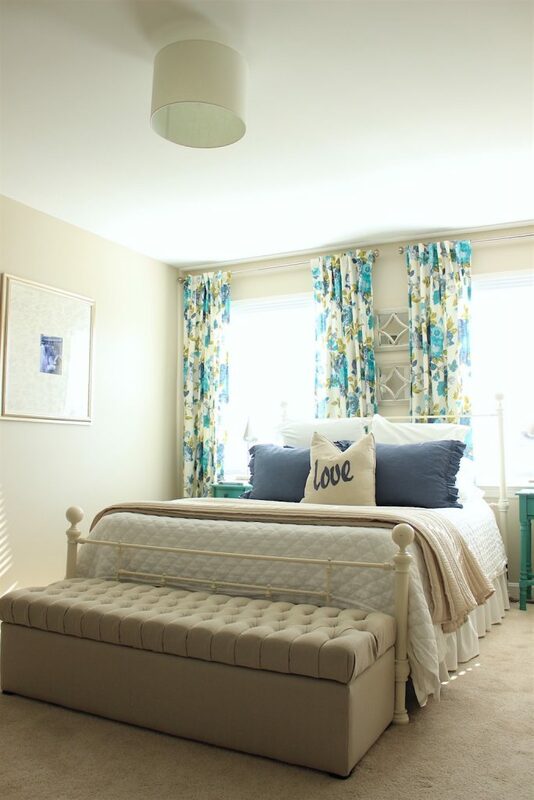 Here’s another space from our master bedroom. 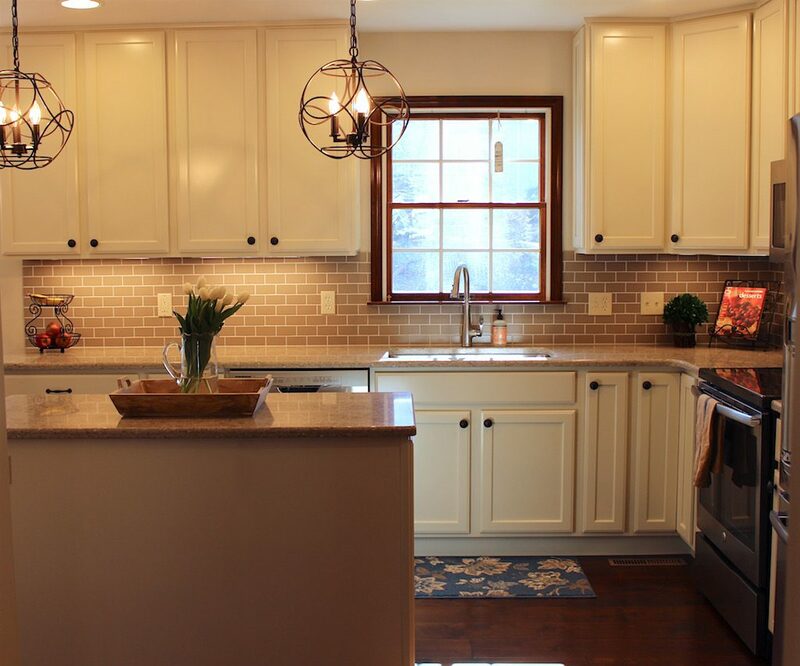 This was the first kitchen I had the pleasure of working on and although you can only see it here above the window, we carried the color through the bulk of their main level. I did end up cutting the paint by 50% here as the full strength of the Accessible Beige was reading too heavy in their space. A little lighter and brighter was all it needed! 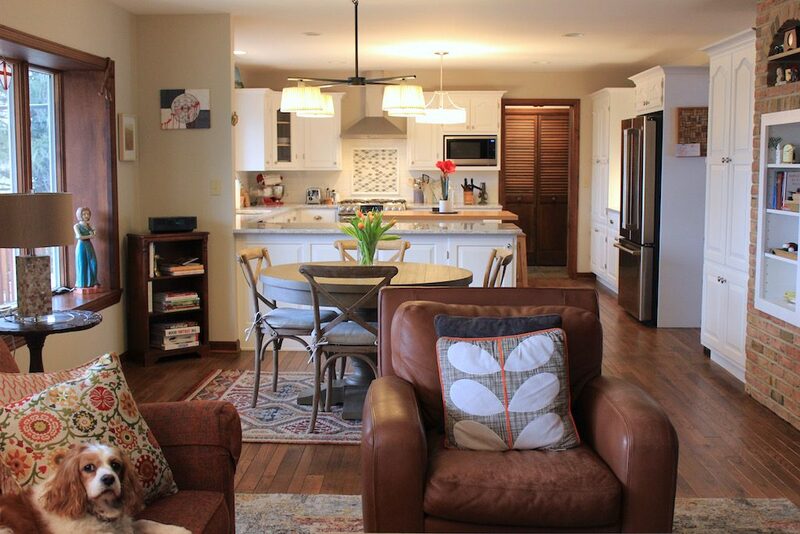 This was another beautiful home that I helped specify color and finishes for. 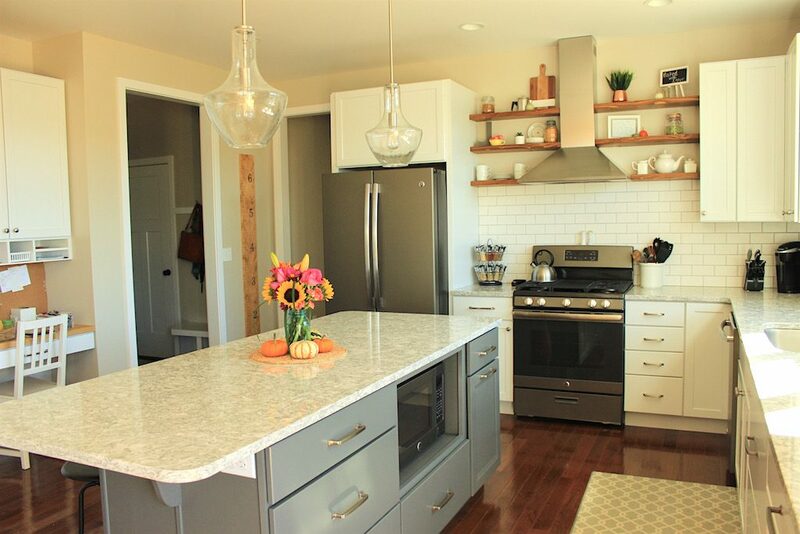 You can see that even with the blue gray island, the Accessible Beige compliments it and warms up the entire space. Here’s another shot of the color in that same home. This is their mudroom that falls just off of the kitchen. Here’s one final home that I was brought on to help renovate. 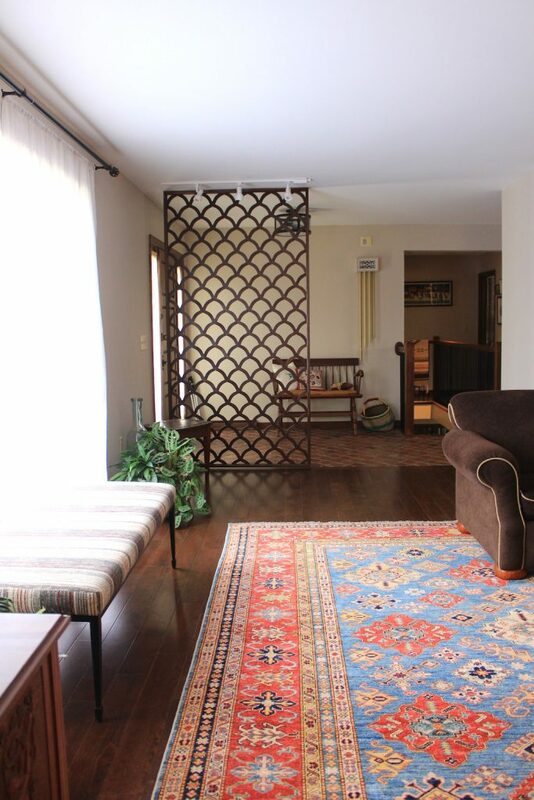 I love how the Accessible Beige updated this home and worked well with much of the brown and orange decor. Here’s a final shot of that same home from the front of the house, to give you another look at the way the wall color pulled everything together. Lovely, isn’t it?! Now, I’m not saying that this color is guaranteed to work for you. I have certainly pulled it out in some homes where it did absolutely nothing for their rooms. But in the right places with the right complimentary colors, it can do wonders! If you are local to the State College area and need help finding the right paint colors for your home, don’t hesitate to reach out! I’d be more than happy to schedule a consultation with you. Marisa, how would you compare this color to SW “Agreeable Gray”? Thanks for your input. Hi Laura! I just shot you an email with a visual, but in response to this question, the main difference is that Accessible Beige has a green undertone and Agreeable Grey has a violet undertone. 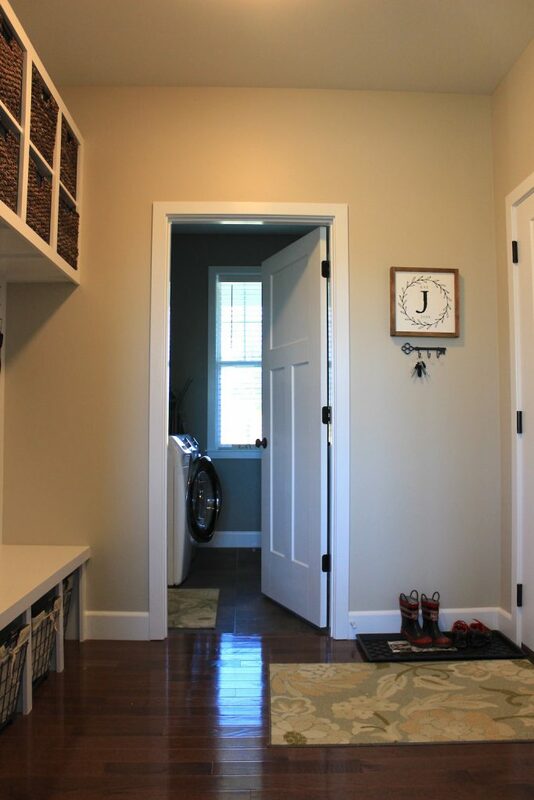 Both are beautiful colors used in the right place (I have Agreeable Gray in our family room). Hope that helps!